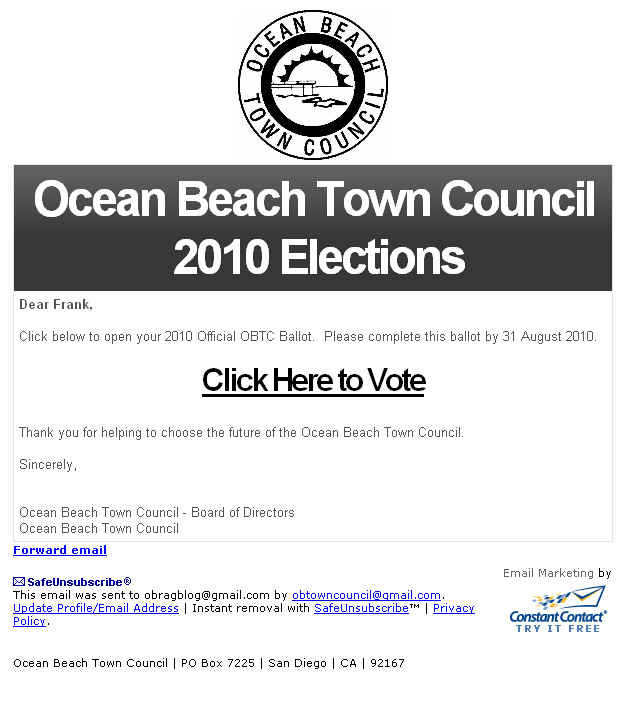 After all that’s been said and done around my candidacy and membership failures with the Ocean Beach Town Council, they still sent me a ballot so I could vote on the remaining candidates (no, my name was not on it). I was specifically told that I could not vote either. I could not be a candidate and I could not vote. If my business was not a good enough reason for me to vote as a business owner in OB, then it’s not good enough for me to vote in the board election. I received an e-ballot to vote. In my email was a nice ballot from the OBTC. Here it is – above. I sent it back blank. Thanks Dew for coming on board. Sorry you don’t see the irony or hypocrisy in all of this. Well if the council revoked his rights, wouldn’t it be fraudulent to attempt to exercise them anyway? Not saying that the council was right in revoking his rights, but that is what they in effect did, isn’t it? Frank, as we told you Wed. night., Suzi More and I were at the Town Council Meeting to accept money from the Board for the Friends of the OB Library to be applied toward the purchase of badly needed new carpeting. I firmly believe that if it weren’t for your efforts almost two years ago in organizing the rally in support of saving our library, as well as the others that were on the chopping block, we wouldn’t have been there accepting grant money for the library because there would no longer be an OB library! Mayor Sanders later said that it was the OB activism and your rally that made him re-think his position on closing branch libraries. Continue your activism, build up the Town Council membership with your supporters and next year there will be no stopping you. Just because a person , any person is not on a ” bored” or a panel , does not mean they can not have an impact on a community. So Frank goes to all the Council Meetings or is he the Meg of OB? If you’re not on the board you’re not even allowed to go to half of them.